I’ve recently changed my company car, and I spent a few weeks shopping around to choose a new one. Everyone has their own car-buying criteria, but you probably start off with a rough idea of the car you want by size, budget and maybe features such as number of doors or seats. For me, it’s about the look of the car first, and the ‘feel’ of the car second. For some people it will be the other way round, or maybe it’s the sound of the car that’s more important to them. Is it a brochure? Is it a catalogue? Car companies appear to be treating their brochures more like catalogues (remember, I’m a bit of an expert having spent 18 years in the home shopping industry). The Ibiza is sharper and more dynamic than ever. Taut lines respect its sporty nature, and the stylish front end has a definite glint of mischief in its headlights. Then it’s the sections that make me most tetchy. They show page after page of lovely pictures of upholstery, or wheels, or colours – but presented with the car options as captions. Folks, it should be the other way around! Show the car options first – because by this point the prospective customer probably has an idea which car they are likely to choose – and then let the customer decide which colour they want! With wheels and upholstery, you may not even have a choice, as the model you’ve picked will be probably be supplied with these as standard. 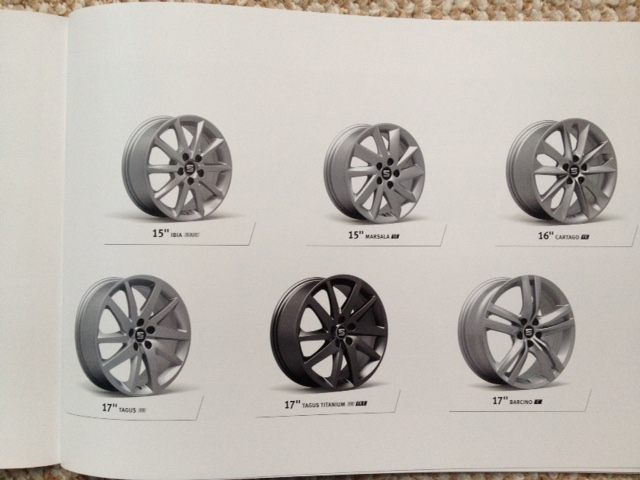 They might have a page with a picture of the various different types of alloy wheel they make. Under each wheel is a tiny caption explaining which car model/s has that wheel (see picture above). But human beings don’t choose a car like that. I doubt anyone chooses a car because of the number of spokes on the wheel. Do you? What the companies need to do is show which wheel options go with YOUR car. That’s all. As a customer, you don’t want a brochure that contains all the options and features that you can’t have on the car you’ve picked. Better to have a separate brochure (or section) per model, that only includes the options for that model. If you’re tempted to produce a brochure, think about how the customer buys and the choices they make, not what and how you sell. And you can always ask me if you’d like some help. How badly written is Facebook’s update about their new T&Cs?